South Africa has produced many 'greats' across the widest spectrum of sports for well over a century, but cricketer Jacques Henry Kallis stands amongst the most elite of all. 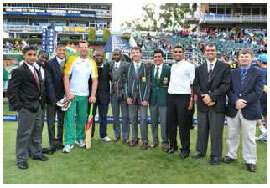 Kallis has established himself as one of the finest all-rounders in the history of the game. For longevity and reliability across three formats alone, many place him at the top of the list. For Jacques Kallis, affording others less fortunate to have the opportunities and education he did, has always been at the forefront of his mind, which is why at the age of 29 he established the Jacques Kallis Scholarship Foundation. Every cent of the R550,000 he raised during his Western Province Benefit Year was used to start the Foundation, which places equal importance on providing educational as well as cricketing opportunities to promising scholars. The Foundation is also indebted to Madeleine Hilterman, who made a large donation in 2009, as well as many other corporates and individuals who have supported us to continue to provide these opportunities. As a proud Wynberg Boys High School old boy, Jacques naturally started with his Alma Mater, but the Foundation almost immediately expanded to include sending boys to Maritzburg College, Selborne College and Pretoria Boys High School - all of which boast proud cricketing traditions, along with excellent education. The Foundation aims to cover the complete costs of tuition fees, boarding and cricket for the chosen candidates. The criteria for selection of these scholars include: 1) academic soundness, 2) financial need, and 3) cricketing potential. The Foundation enjoys a wide variety of support but is aiming to reach even further and expand the number of scholarships awarded. As Nelson Mandela said, "Education is the most powerful weapon which you can use to change the world." At the Foundation we would like to change the world of a few more South African scholars. Should you be interested in investing in one or more of our boys futures, your commitment would be recognized in various ways. Updates and information about the boys can be seen on our website (www.kallis.co.za). You will also be entitled to priority invitations to Foundation events. Just the opportunity to go to a school like Maritzburg College, and to meet the people I did is something I will be forever grateful for. Meeting Jacques, and being a scholar of the Jacques Kallis Foundation was just an unbelievable experience, and I'm now so much better off for it. I wouldn't be where I am today without the Foundation. Jacques was absolutely fantastic. One of the big things for me was that when we first met, he made it clear to me that the Foundation itself is not only about cricket. It is more about education, and that if you ended up not wanting to play cricket anymore halfway through your school life, it's fine. For me, those were resounding words, and they really helped me a lot so that I never felt pressured. With the help of the Foundation, I never felt too far away from home or like a lonely duck over here in the Western Cape. It is by far the best thing that has ever happened to me. If you look at financial backing in terms of finishing school, all the costs that come from being away from home, and most importantly, being able to partake in everything that is happening at the school - it's very expensive and the Foundation backed me the whole way. The Foundation is a registered Public Benefit Organisation, and any contribution is thus fully tax deductible.